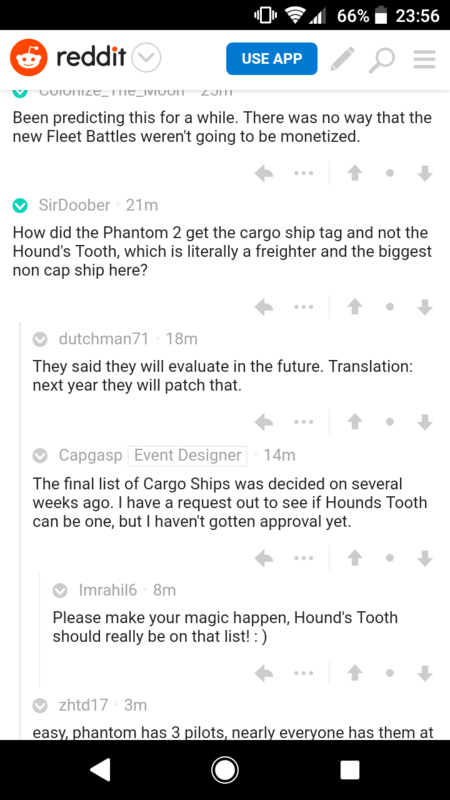 Why doesn't Hound's Tooth have the Cargo Ship tag? Can someone explain to me why Slave I gets the Cargo Ship tag, but Hound's Tooth—a YV-666 FREIGHTER—doesn't? Please add the tag to make some logical sense and also to give more options for the cargo event. Thanks. Thanks. Apparently I just need to be on the official forums, aka reddit, to get to hear anything from devs. Smh. Exactly. You'd think that they'd want to use this as another way to push packs for their new marquee ship. Clearly the Hounds Tooth is a snub fighter cunningly disguised as a cargo ship! In related news Home One has been redesignated as a Corvette and Biggs' X-Wing will be the Rebels' new capital ship. Probably because you would just be able to auto the event with it. I figured it was because Bossk is a bounty hunter, not a smuggler. *shrugs* Makes no difference to me, but it'd be nice if it was. So is Boba. And Slave I is a modified Firespray patrol craft (so, not very cargo ship). Hounds Tooth not being a cargo ship is weird, as its one of the few actual freighters. Phantom II being a cargo ship is weird to me. It's a tiny little thing, that attaches to the Ghost most of the time. What cargo could it transport? A few cartons of Death Sticks, perhaps? Probably to avoid the same backlash they have when a new marquee is required for platoons at 5*+. "Typical CG, making the new marquee ship a requirement for the new ship event. Blatant cash grab by an evil greedy developer!!1!" Y'know, that kind of thing. Clearly there's no escaping it. On first blush, my guess it's that all of the other ships belong to smugglers, and Bossk is a bounty hunter. But then that doesn't explain Slave 1 being included unless there's something about Boba Fett in the lore I'm not aware of (totally possible) that would explain it. Or maybe they just included Boba because they'd only have 4 ships without him and that BHs are kind of a grey area in that regard. I think a better question is why can't it die outside of Thrawns 1 shot?